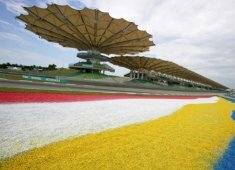 The Sepang International Circuit is looking forward to this year's Malaysian Grand Prix after the adored track was renovated at the start of the year. The main change is that the entire circuit was resurfaced. F1technical.net contacted the circuit and asked about the exact modifications. The Malaysian GP, which usually took place in the early part of the season in recent years, hosts this year’s race on the 2nd of October. The track, which usually proves to be rather challenging and demanding due to the high temperatures and humidity, has gone through some changes for 2016 over the winter. The entire track was resurfaced. The work was carried out by Dromo, an Italian design firm. Turn two, five and fifteen were modified in terms of “ the gradient of the track,” said Roy Ramesh, the Sepang track officier to f1technical.net. Turn two became smoother because the sharp drop has been eliminated. It means an easier, smoother exit is now possbile out of the slowish turn onto the following long full-throttle section. Furthermore, the works also aimed “the improvement of the drainage system.” It often plays a big role as heavy, sudden showers are not unknown in Malaysia. Most of the changes were made in the hope of making overtaking easier on the high-speed track of Sepang. The new date for the Malaysian GP also means a logistical ‘relief’ as the previous race takes place in Singapore which makes the transportation of the cars and equipment much more easier then before. “Our team in Sepang Circuit are consistently in contact with the appointed logistic to ensure smoothness of the transportation in/out of the circuit,” concluded Ramesh to f1technical.net.